Collins, Jim, and Glenn B. Opitz, editors. Women Artists in America: 18th Century to the Present (1790–1980). Poughkeepsie, NY: Apollo, 1980. Illustrates the paucity of information available on women artists. Entries include name, date and place of birth and death, artistic designation (e.g. painter), schooling, awards, membership in artistic associations, public collections holding works. Dictionnaire Biographique du Canada. Toronto: University of Toronto Press, 1966–. Intended to be on par with the Dictionary of American Biography and the English Dictionary of National Biography. Organized chronologically; for instance volume I covers 1000 to 1700. Lengthy signed articles with extensive bibliographies. In progress; currently up to 1920. Falk, Peter Hastings, editor. Who Was Who in American Art, 1564–1975: 400 Years of Artists in America. Madison, CT: Sound View Press, 1999. The best first place to check to find basic information on an artist who worked in America. Covers 50,000+ painters, printmakers, sculptors, photographers, decorative and applied artists, as well as critics and historians, who worked in the U.S. Entries contain basic information on schooling, teaching, selective exhibition history, collections that own the artist’s work, commentary on important figures, and bibliographic citations. Farris, Phoebe, editor. Women Artists of Color: A Bio-Critical Sourcebook to 20th-Century Artists in the Americas. Westport, CT: Greenwood Press, 1999. Matuz, Roger, editor. St. James Guide to Native North American Artists. Detroit: St. James Press, 1988. Selection of 350+ biographical and critical articles on native North American artists in all media working in the 20th century. Entries include biographical data (variant names and tribal affiliation where appropriate), exhibitions, publications, collections, artist’s statement, illustration, and an essay on the artist. Opitz, Glenn B., editor. Dictionary of American Sculptors: 18th Century to the Present. Poughkeepsie, NY: Apollo, 1984. Biographical entries for 5,000+ American sculptors. Entries include birth and death dates and locations (when known), schools attended, where work is collected or located, membership in professional organizations, teaching positions held, awards won, and where work was exhibited. ———. Mantle Fielding’s Dictionary of American Painters, Sculptors, and Engravers, 2nd edition. Poughkeepsie, NY: Apollo, 1986. Basic biographical dictionary of American artists. Original edition published in 1926. Biographical articles on 12,000+ artists include information on awards, group and solo shows, museums holding the artist’s work, association memberships, and teaching experience. Concentrates on lesser-known figures rather than on leading artists about whom information is readily available from other sources. Riggs, Thomas, editor. St. James Guide to Black Artists. Detroit: St. James Press, 1997. Includes nearly 400 19th- and 20th-century painters, sculptors, printmakers, photographers, ceramicists, and textile workers of African descent. Most of the artists are African-American; the remainder are from Africa, the Caribbean, and other parts of the diaspora. Entries include basic biographical data, exhibition history, works in collections, bibliographical references, some criticism, and, where available, a comment by the artist. Who’s Who in American Art. New York: Bowker, 1935–. Formerly published as part of American Art Annual. Includes biographical sketches of artists, craftsmen, administrators, collectors, dealers, scholars, critics, curators, and illustrators in the U.S. and Canada. Entries may include birth date and place, schooling/training, exhibitions, professional classification, works in public collections, publications, positions held in schools/museums/organizations, memberships in art societies, honors and awards, media, dealer, and mailing address. Shipp, Steve. Latin American and Caribbean Artists of the Modern Era: A Biographical Dictionary of More than 12,700 Persons. Jefferson, NC: McFarland, 2003. References for painters, watercolorists, muralists, sculptors, ceramicists, photographers, graphic artists, multimedia and mixed-media artists, installation artists, tapestry designers, and architects in 39 countries. Entries include places and dates of birth and death, brief biographical information and career overview, collections, exhibitions, titles of important works, and bibliographies. Turner, Jane, editor. Encyclopedia of Latin American and Caribbean Art. Macmillan Reference Limited, 2000. Covers the arts and culture of every country in the Western Hemisphere except Canada and the United States, from the European conquest to the present day. Country surveys chart the evolution of artistic traditions and the melding of European and native art forms in architecture and fine arts and also in decorative arts, and discuss art patronage and training in each nation. Also includes artist biographies from the earliest named craftsman, Juan Tomás Tuyru Tupac Inca, to Jac Lierner, the youngest artist profiled. 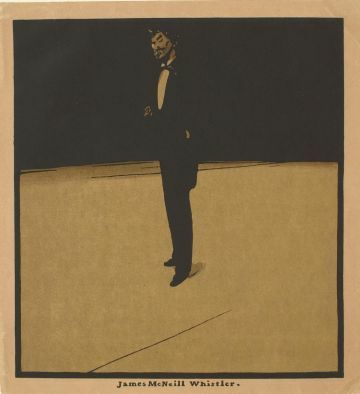 Russell, after William Nicholson. James McNeill Whistler Standing, 1897. Lithograph on paper. Sterling and Francine Clark Art Institute, Williamstown, MA. Mortimer Menpes. 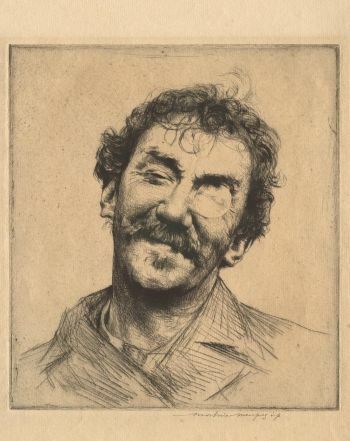 James Abbott McNeill Whistler Smiling, [no date]. Etching and drypoint on laid paper. Acquired by the Sterling and Francine Clark Art Institute.